Hitch Studio specializes in graphic and web design services in South Dakota. As a startup ourselves, we understand the struggles of small, local businesses to compete in a dense market. Good thing, having an online presence helps to level the playing field for both large and small businesses in various industries. But still, startups need to step up to stay ahead of the competition — and we are here to provide you that edge by designing you a professional website. With our expertise in branding, graphics, animation, photography and web design, we create an eye-catching and user-friendly website for you. This way, you can connect better with your target market. We make sure that every element of the web design — from the logo to the banner images — represents your brand effectively. Your business cards, brochures, and other traditional marketing materials need a powerful design, too. We work on your collaterals based on your ideas. We create a design that best communicates what you can do for your clients. After all, we want your brand to be top of mind. We offer professional WordPress website design. Our customized, responsive designs make it easy for users to navigate your site. We ensure user-friendliness for mobile applications and a quick load speed. Each site is optimized for search engines and we ensure security with our professional level website care packages (not included in website design fee). Hitch also offers domain and hosting services! Find out more here! If you are looking to update your current branding or if you are starting a new business and need a logo, we have options for you! We provide you with both vector (scalable) files and image files of your logo designs in both color and black and white to meet your needs. Want some best practices for using your logo? Ask about our Style Guide add-on! Need help getting your product or service out there? We can help with business cards, brochures, mailers etc. We love your unique ideas and will figure out the best way to present your business to your customers. Make an appointment with Carrie! Take a look at some of our work and see if our style is a right fit for you. 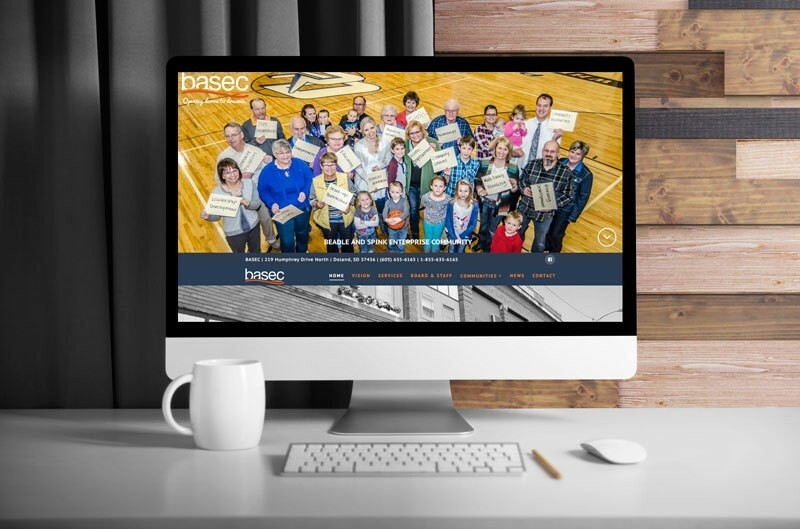 BASEC is a non-profit organization that focuses on creating opportunities for its communities to be healthy, vital and have the capacity to produce results they care about. Its focus is mainly Beadle and Spink counties in South Dakota. They offer loans, technical assistance and more! It was a true pleasure working with the BASEC team on this project. Seeing their passion and hard work was such a treat. Thanks you for choosing to work with me!